Thyme for Cooking easy recipes: Spicy Beef Enchiladas. Since tortillas come in packages of six (or eight), we'll have at least one left to use in the Starter tomorrow night. If you still have 2 left after that, you can use them for wraps or cut them into triangles, sprinkle on some salt, garlic powder, whatever, and bake until light brown, about 15 minutes - Voila! Taco Chips! Drain chilies, chop if whole. Heat oil in large nonstick skillet. Add chili powder, cumin, and sauté 1 minute. Add onion and garlic; sauté 5 minutes. Add 1/3 of the beans and enough taco sauce to just kind of hold it all together, 1/3 - 1/2 cup. Remove from heat. Add green chilies and 1/2 cup of the cheese, mix well. Put 1/2 cup tomato sauce into a baking dish large enough to hold 4 enchiladas. Divide the beef/bean mixture into fourths. Spoon each fourth onto a tortilla and roll up. Place seam side down on the sauce in the baking dish. 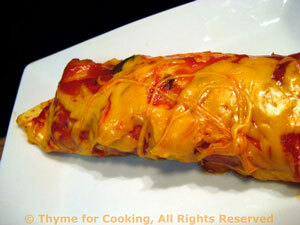 Spoon the Enchilada/Taco sauce over the finished enchiladas, sprinkle with the remaining 1/2 cup cheese. Bake at 375F (190C) for 20 minutes, until heated through and cheese is bubbly. Taco Chips: Cut tortillas into triangles, sprinkle on some salt, garlic powder, whatever, and bake until light brown, about 15 minutes - Voila! Taco Chips!